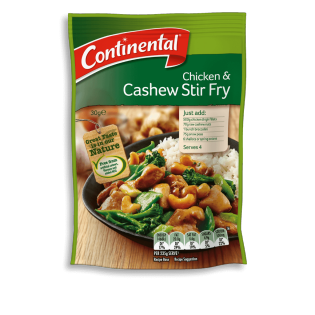 Continental's chicken & cashew stir fry recipe base is made with authentic Chinese flavours. Learn how to create this family favourite dish here. This was a family favourite in my house. So very disappointed to read it's been discontinued. Who makes these Decisions!?! I have looked in all coles and woolworths store close to where I live and they have discontinued this item. very unhappy. will not give it any stars.Can you tell me where I might be able to get this. Hi, we regret to inform you that this recipe base has been deleted. We are sorry to be the bearer of bad news, product deletions are certainly something we strive to avoid. We will be sure to pass your feedback along to our Continental marketing team. Why do You have this chicken & cashew recIpe BAse advertised on Your website, when it has been advertised that this product is deleted and no longer available . This was quick and easy to cook and delicious . Especially when on nightshifts or beeN at work all day. Hi, sorry to inform you but our Chicken & Cashew Stir Fry has been deleted. You might still find residual stock in IGA/Metcash stores.